Painting by Renée Othot for Simon Plouffe’s birthday. It’s here—the Pi Day of the Century happens on Saturday: 3-14-15! How will you celebrate? You might check to see if there are any festivities happening in your area. There might be an event at a library, museum, school, or university near you. John Conway at the pi recitation contest in Princeton. I do feel compelled to point out that besides base 10 being an arbitrary way of representing pi, one of the reasons I’m not fond of digit reciting contests is that, to steal an analogy I read somewhere, memorizing digits of pi is to math as memorizing the order of letters in Robert Frost’s poems is to literature. It’s not an intellectually meaningful activity. I haven’t memorized very many digits of pi, but I have memorized a digit of pi that no one else has. Ever. In the history of the world. Probably no one has ever even thought about this digit of pi. And you can have your own secret digit, too—all thanks to Simon Plouffe‘s amazing formula. Simon’s formula shows that pi can be calculated chunk by chunk in base 16 (or hexadecimal). A single digit of pi can be plucked out of the number without calculating the ones that come before it. The discovery of this formula came as a surprise. For centuries it had been assumed that there was no way to compute the nth digit of π without calculating all of the preceding n − 1 digits. Check out some of Simon’s math art! Simon is a mathematician who was born in Quebec. In addition to his work on the digits of irrational numbers, he also helped Neil Sloane with his Encyclopedia of Integer Sequences, which soon online and became the OEIS (previously). Simon is currently a Trustee of the OEIS Foundation. There is a wonderful article by Simon and his colleagues David Bailey, Jonathan Borwein, and Peter Borwein called The Quest for Pi. They describe the history of the computation of digits of pi, as well as a description of the discovery of their digit-plucking formula. According to the Guinness Book of World Records, the most digits that someone has memorized and recited is 67,890. Unofficial records go up to 100,000 digit. So just to be safe, I’ve used an algorithm by Fabrice Bellard based on Simon’s formula to calculate the 314159th digit of pi. (Details here and here.) No one in the world has this digit of pi memorized except for me. Ready to hear my secret digit of pi? Lean in and I’ll whisper it to you. The 314159th digit of pi is…7. But let’s keep that just between you and me! And just to be sure, I used this website to verify the 314159th digit. You can use the site to try to find any digit sequence in the first 200 million digits of pi. Next up: we met Aziz Inan in last week’s post. This week, in honor of Pi Day, check out some of the numerical coincidences Aziz has discovered in the early digits in pi. Aziz and his colleague Peter Osterberg wrote an article about their findings. By themselves, these observations are nifty little patterns. Maybe you’ll find some more of your own. (This kind of thing reminds me of the Strong Law of Small Numbers.) As Aziz and Peter note at the end of the article, perhaps the study of such little patterns will one day help to show that pi is a normal number. And last up this week, to get your jam on as Saturday approaches, here’s the brand new Pi Day Anthem by the recently featured John Sims and the inimitable Vi Hart. Squares and circles are pretty different. Squares are boxy and have their feet firmly on the ground. Circles are round and like to roll all over the place. Since they’re so different, people have long tried to bridge the gap between squares and circles. There’s an ancient problem called “squaring the circle” that went unsolved for thousands of years. In the 1800s, the gap between squares and circles was explored by Gabriel Lamé. Gabriel invented a family of curves that both squares and circles belong to. In the 20th century, Danish designer Piet Hein gave Lamé’s family of curves the name superellipses and used them to lay out parts of cities. One particular superellipse that’s right in the middle is called a squircle. Squircles have been used to design everything from dinner plates to touchpad buttons. Things made with straight lines fit well together and save space. And we can move easily — physically or mentally — around things made with round lines. But we are in a straitjacket, having to accept one or the other, when often some intermediate form would be better. … The super-ellipse solved the problem. It is neither round nor rectangular, but in between. Yet it is fixed, it is definite — it has a unity. “Squaring the Circle” by Troika. These circles aren’t what they seem to be. There’s another kind of squircular object that I ran across recently. It’s a sculpture called “Squaring the Circle”, and it was created by a trio of artists known as Troika. Check out the images on this page, and then watch a video of the incredible transformation. You can find more examples of room-sized perspective-changing objects in this article. Next up: it’s been a snowy week here on the east coast, so I thought I’d share some ideas for a great indoor activity—coloring! Marshall Hampton is a math professor at University of Minnesota, Duluth. Marshall studies n-body problems—a kind of physics problem that goes all the way back to Isaac Newton and that led to the discovery of chaos. He also uses math to study the genes that cause mammals to hibernate. Marshall made a coloring book full of all kinds of lovely mathematical images for his daughter Violet. He’s also shared it with the world, in both pdf and book form. Check it out! Inspired by Mashrall’s coloring book, Alex Raichev made one of his own, called Contours. It features contour plots that you can color. Contour plots are what you get when you make outlines of areas that share the same value for a given function. Versions of contour plots often appear on weather maps, where the functions are temperature, atmospheric pressure, or precipitation levels. Contour plots are useful. Alex shows that they can be beautiful, too! And there are even more mathematical patterns to explore in the coloring sheets at Patterns for Colouring. Last up, that’s not a typo in this week’s post title. I really do want to share some snowfakes with you—some artificial snowflake models created with math by Janko Gravner and David Griffeath. You can find out more by reading this paper they authored, or just skim it for the lovely images, some of which I’ve shared below. I ran across these snowfakes at the Mathematical Imagery page of the American Mathematical Society. There are lots more great math images to explore there. This gear sphere and many others are the creations of Paul Nylander. There are 92 gears in this gear sphere. Can you figure out how many there are of each color? Do you notice any familiar shapes in the gears’ layout? What’s especially neat are the sizes of the gears—how many teeth each gear color has. You can see the ratios in the upper left corner. Paul describes some of the steps he took to find gears sizes that would work together. He wrote a computer program to do some searching. Then he did some precise calculating and some trial and error. And finally he made some choices about which possibilities he liked best. Sounds like doing math to me! Along the way Paul figured out that the blue gears must have a number of teeth that is a multiple of five, while the yellow ones must have a multiple of three. I think that makes sense, looking at the number of red gears around each one. So much swirly symmetry! Be sure to check out some of Paul’s other math art while you’re on his site. Plus, you can read about a related gear sphere in this post by mathematician John Baez. I figured there had to be a good math game that involves gears. I didn’t find quite what I expected, but I did find something I like. It’s a game that’s called—surprise, surprise—Gears! It isn’t an online game, but it’s easy to download. Can you find the moves to make all the gears point downwards? And if you’re in the mood for some more gear gaming and you have access to a tablet or smartphone, you should check out Wuzzit Trouble. It’s another free download game, brought to you by “The Math Guy” Keith Devlin. Keith discusses the math ideas behind Wuzzit Trouble in this article on his blog and in this video. Last up this week, I’d like to share with you some souvenirs. If you went on a math vacation or a math tour, where would you go? One of the great things about math is that you can do it anywhere at all. Still, there are some mathy places in the world that would be especially neat to visit. And I don’t mean a place like the Hilbert Hotel (previously)—although you can get a t-shirt or coffee mug from there if you’d like! The mathematician David Hilbert actually spent much of his career in Göttingen, a town and university in Germany. It’s a place I’d love to visit one day. Carl Gauss lived in Göttingen, and so did Felix Klein and Emmy Noether—and lots more, too. A real math destination! Lots of math has been inspired by or associated with particular places around the world. Just check out this fascinating list on Wikipedia. Did you know that our word souvenir comes from the French word for “memory”? One thing that I like about math is that I don’t have to memorize very much—I can just work things out! But every once in a while, there is something totally arbitrary that I just have to remember. Here’s one memory-helper that has stuck with me for a long time. May you, like our alligator friend, find some good math to munch on. Bon appetit! I’ve been really into squares lately. Maybe it’s because I recently ran across a new puzzle involving squares– something called Mrs. Perkin’s quilt. 69 by 69 Mrs. Perkin’s quilt. Said in another way, if you have a 13 by 13 square, how can you divide it up into the smallest number of smaller squares? Don’t worry, you get to solve it yourself– I’m not including a picture of the solution to that version of the puzzle because there are so many beautiful pictures of solutions to the puzzle when you start with larger and smaller squares. Some are definitely more interesting than others. If you want to start simple, try the 4 by 4 version. I particularly like the look of the solution to the 18 by 18 version. Maybe you’re wondering where I got all these great pictures of Mrs. Perkin’s quits. And– wait a second– is that the solution to the 152 by 152 version? It sure is– and I got it from one of my favorite math websites, the Wolfram Demonstrations Project. The site is full of awesome visualizations of all kinds of things, from math problems to scans of the human brain. The Mrs. Perkin’s quilts demonstration solves the puzzle for up to a 1,098 by 1,098 square! I might not want to rely on this calculator to do my homework, but it certainly is interesting! Finally, meet Snap the Turtle! This cute little guy is here to teach you how to make beautiful math art stars using computer programming. On the website Tynker, Snap can show you how to design a program to make intricate line drawings– and learn something about computer programming at the same time. Tynker’s goal is to teach kids to be programming “literate.” Combine computer programming with a little math and art (and a turtle)– what could be better? I hope something grabbed your interest this week! Bon appetit! Some recent doodling, by me. As you start a new school year, you might be looking for some new mathy doodle games to play in the margins of your notebooks. Doodling helps me to listen sometimes, and I love making neat patterns. I especially like seeing what new shapes I can make. This summer I was very happy to run across Zentangle®—”an easy-to-learn, relaxing, and fun way to create beautiful images by drawing structured patterns.” I’ve learned a lot about Zentangle from a blog called Tangle Bucket by Sandy Hunter. She shares how to doodle snircles, snafoozles, and oodles. There’s a whole dictionary of zentangle shapes over at tanglepatterns.com. Maybe you’ll pick some tangle patterns to combine with each other. If you try some, maybe you’ll share them in our Readers’ Gallery. It’s so true that the more I tangle, the more I see the potential in patterns all around me. I catch myself mentally deconstructing them (whether I want to or not) to figure out if they can be broken down into simple steps without too much effort. That’s the trademark of a good tangle pattern. Try some of Sandy’s weekly challenges, or check out Tiffany Lovering’s time-lapse videos—here’s one with music and one with an interview. Can you learn the names of any of the shapes she creates? I spy a Rick’s Paradox. There are lots of ways to begin zentangling—I hope you enjoy giving it a try. Squares & dots & crosses, oh my! If zentangling is too freeform for your doodling tastes, then let me share with you one of my longtime favorite websites. I’ve used it for years to help me to do math and to teach math, and it’s great for math doodling, too. I might even call it a trusty friend, one that I met one day through the simple online search: “free online graph paper”. That’s right, it’s Free Online Graph Paper. 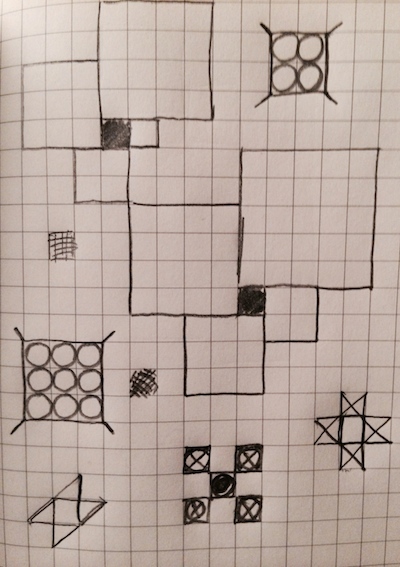 Something I love about the site is that it lets you design different aspects of your graph paper. Then you can print it out. First you get to decide what kind of grid you would like: square? triangular? circular? Then you get to tinker with lots of variables, like how big the grid cells are, how dark the lines are, and what color they are. And more! Free Online Graph Paper was created by Kevin MacLeod, who composes music and shares it for free. That way other people can use it for creative projects. That’s really awesome! I enjoyed listening to Kevin’s “Winner Winner“. It’s always good to be reminded that everything you use or enjoy was almost certainly made by a person—including custom graph paper websites! Last up this week is some doodly math that you can really munch on. Everyone knows that breakfast is the most important meal of the day and that the most important food group is roulette curves. To get your daily recommended allowance of groovy math, look no further than the edible doodles of Nathan Shields and his family over at Saipancakes. I can wait until the Shields family tackles the cissoid of Diocles. Stomachion, Toilet Math, and Domino Computer Returns! So, what do you do? The puzzle is made up of these fourteen pieces carved out of a 12 by 12 square– and the challenge is to make as many different squares as possible using all of the pieces. No one is totally sure who invented the Stomachion puzzle, but it’s definite that Archimedes, one of the most famous Ancient Greek mathematicians, had a lot of fun working on it. Sometimes Archimedes used the Stomachion pieces to make fun shapes, like elephants and flying birds. (If you think that sounds like fun, check out this page of Stomachion critters to try making and this lesson about the Stomachion puzzle from NCTM.) But his favorite thing to do with the Stomachion pieces was to arrange them into squares! It’s clear that you can arrange the Stomachion pieces into a square in at least one way– because that’s how they start before you cut them out. But is there another way to do it? And, if there’s a second way, is there a third? How about a fourth? Because Archimedes was wondering about how many ways there are to make a square with Stomachion pieces, some mathematicians give him credit for being an inventor of combinatorics, the branch of math that studies counting things. Other mathematicians have worked on finding the number of ways to arrange the Stomachion pieces into other shapes– such as triangles and diamonds. Given that it took until 2003 for someone to find the solution for squares, there are many, many open questions about the Stomachion puzzle just waiting to be solved! Who knows– if you play with the Stomachion long enough, maybe you’ll discover something new! Finally, a little blast from the past. Almost two years ago I share with you a video of something really awesome– a computer made entirely out of dominoes! Well, this year, some students and I finally got the chance to make one of our own! It very challenging and completely exhausting, but well worth the effort. Our domino computer recently made its debut on the mathematical internet, so I thought I’d share it with all of you! Enjoy!